Musheer Hussain, Edward Fisher, Robin Youngs, Jonathan Fishman,	The Journal of Laryngology & Otology, Volume 130 Issue 7, p 605. K A Peng, E P Wilkinson,	The Journal of Laryngology & Otology, Volume 130 Issue 7, pp 606-610. A Ashman, O T Dale, D L Baldwin,	The Journal of Laryngology & Otology, Volume 130 Issue 7, pp 611-615. A Tatar, M Korkmaz, M Yayla, M S Gozeler, V Mutlu, Z Halici, H Uslu, H Korkmaz, J Selli,	The Journal of Laryngology & Otology, Volume 130 Issue 7, pp 616-623. B F Van Esch, P P G Van Benthem, H J Van Der Zaag-Loonen, TJ D Bruintjes,	The Journal of Laryngology & Otology, Volume 130 Issue 7, pp 624-627. S Morris, T Martin, D Mccahon, S Bennett,	The Journal of Laryngology & Otology, Volume 130 Issue 7, pp 628-634. G B Singh, R Arora, S Garg, S Kumar, D Kumar,	The Journal of Laryngology & Otology, Volume 130 Issue 7, pp 635-639. Role of atopy in chronic rhinosinusitis with nasal polyps: does an atopic condition affect the severity and recurrence of disease? QC Li, KJ Cheng, F Wang, SH Zhou,	The Journal of Laryngology & Otology, Volume 130 Issue 7, pp 640-644. A Harrison, J Montgomery, F B Macgregor,	The Journal of Laryngology & Otology, Volume 130 Issue 7, pp 645-649. K Sato, S Chitose, T Kurita, H Umeno,	The Journal of Laryngology & Otology, Volume 130 Issue 7, pp 650-655. K Sato, S Chitose, T Kurita, H Umeno,	The Journal of Laryngology & Otology, Volume 130 Issue 7, pp 656-661. 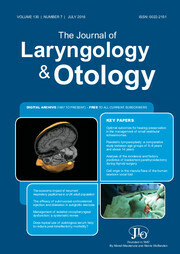 M Kara, H Erdoğan, H B Altinişik, H Aylanç, O Güçlü, F S Dereköy,	The Journal of Laryngology & Otology, Volume 130 Issue 7, pp 662-668. R W A Hone, T Tikka, A I Kaleva, A Hoey, V Alexander, A Balfour, I J Nixon,	The Journal of Laryngology & Otology, Volume 130 Issue 7, pp 669-673. M Wierzbicka, M Tokarski, M Puszczewicz, W Szyfter,	The Journal of Laryngology & Otology, Volume 130 Issue 7, pp 674-679. S Ali, J C-L Yeo, T Magos, M Dickson, E Junor,	The Journal of Laryngology & Otology, Volume 130 Issue 7, pp 680-685. D M Beswick, E J Damrose,	The Journal of Laryngology & Otology, Volume 130 Issue 7, pp 686-690. W L Neo, N Durisala, E C Ho,	The Journal of Laryngology & Otology, Volume 130 Issue 7, pp 691-695.